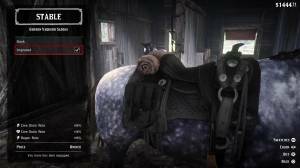 Aside from the stat bonuses your horse can permanently get through bonding, you can also further increase its stats by buying tacks like saddles and stirrups from Stables. Crafting the Boar Tusk Talisman from any fencer will permanently decrease the degradation rate of your horse’s stamina and health cores by 10% as well. Stables also offer a wide variety of cosmetic upgrades for your horse, including bedrolls, saddlebags, horns, etc. These are the least priority upgrades you should spend your money on, especially if you’re still struggling on funds. Once you have extra cash, you can customize your ride with style. Discounts for having high positive honor ranks are applicable to all provisions, upgrades, and services in the stable. Some of your cargo like outfits, masks, and provisions, are stored in the horse’s saddlebag. Fortunately, it’s impossible to lose your items since your saddle will be retrieved for you automatically upon returning to any stable. You can increase the capacity of your saddlebag by purchasing the Improved versions of them from Stables.